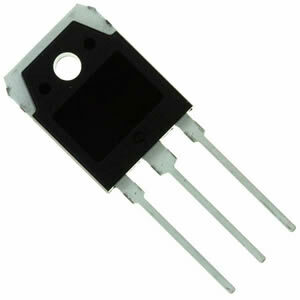 For those of us needing these transistors for a GATES ONE, a possible replacement has been located. Mouser part number 512-FQA13N50CF. It is a TO-3P case. Expensive price of $0.88 per unit in 100 qty, or thereabouts. My engineer buddy says that there will be some changes needed in the biasing, and he promises to provide the details, which will be made available at modest cost.....he would appreciate a cup of coffee for proper compensation. I also get a "finders fee"....same deal. Stay tuned. As soon as I get the info, I will post it. Can't you use the IRFP350PBF as a replacement? The PBF means lead-free, I think. The IRFP is a different case. You can find the right part fairly easily (Mouser, Newark, Digikey, Ebay), so there's no urgent reason to modify the boards. I haven't had any trouble with the lead-free variants. So-far, I haven't found one version that seems to be better (or worse) than others, so I suppose you can shop around without a lot of risk. The older models of the Gates series used it in their IPA board (eventually went to IRFP350), and all of them use it in their PDM amps. SX and Early Gates AM's used the IRF-350. That's the TO-3 style metal case FET. Later Gates AM's used the plastic case IRFP-350 in a TO-247 case, still available for about $2 from anywhere. As I understood, they were electrically interchangeable, the difference is the case styles, which are not interchangeable. 512-FQA13N50CF is a TO3-P case. That will swap with the newer Plastic FETS in the TO-247 case, but not with the older TO-3's which are the problem ones. The old metal TO-3 case version is what Jon is working on for the mod to the TO-3P. It's pretty simple as he explained it. Not having worked on any of the GATES ONE series, I was not aware of the three different versions of devices they had used. As soon as he gets the biasing and mounting documentation done , I will post it. The old metal TO-3 case version is what Jon is working on for the mod to the TO-3P. Good. Those have gotten expensive and it's only going to get worse. Not all IRF350's are created equal. Some are Chinese knockoffs do not hold up under power. If you have IRF350's failing for unknown reasons, better check the manufacturer, could be they're the cheap knockoffs. On the other hand if you're using a 2.5Kw transmitter for 1 Kw output you might not notice any problems. Not all IRF350's are created equal. Some are Chinese knockoffs do not hold up under power. 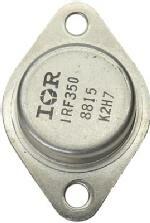 If you have IRF350's failing for unknown reasons, better check the manufacturer, could be they're the cheap knockoffs. I've bought IRFP350s from several outlets, and for prices ranging from about 80 cents to roughly $8 or $9. So-far, I haven't seen a lot of difference in how they perform in the Gates One and Five, so long as the rest of the transmitter is happy. When I have had problems with these transmitters chewing up mosfets, the source has wound up being power supply caps, PDM or oscillator caps and, in the case of a particularly troublesome "Five", 2 of 3 paralleled type 293 caps in the bandpass section that had cracked and leaked. Until those issues were addressed, these transmitters wouldn't go more than a month without randomly blowing a pair or two in a PA deck or PDM amp... and it's the PDMs that still have the IRF-350s... at least in the rigs that I have. Aside from the bandpass filter, the electrolytics have service bulletins that are I think have been mentioned in another thread here. Once I replaced and started monitoring those parts, I've had much less trouble and so-far, no subsequent mosfet failures. I also modified an (antiquated) pattern switching system at a DA2, where the process used to turn the whole transmitter off and on during mode changes, rather than use the mute function. Don't know if that mattered, but it seemed a better way to operate the transmitter. I'm going way out on a limb here, but given their age now, if you have a cranky SX-series rig, you might give the cans a shake. Last edited by RodeoJack on Sun Apr 08, 2018 10:39 pm, edited 9 times in total. If the caps are over about 8yrs and the TX is not living in a refrigerated hut... Just go ahead and order the cap kit. I have one Gates1 that I am about to change the caps for the 2nd time in less than 10 yrs. It just barely passed NRSC last year and I am sure will fail when I check it again in a few weeks.